Increase Traffic | Create a Google Gadget. ~ The Blog Doctor. You are here: Home > Widgets > Increase Traffic | Create a Google Gadget. Increase Traffic | Create a Google Gadget. A Google Gadget is a small application which runs on any website as well as your Google Desktop and provides a specific practical purpose and function. This purpose could be anything from advertising your home site to providing information or running small programs. The content and the Module Preferences code is contained within a <Module>. The Module code is placed after the XML declaration showing that it is an XML file. XML is a general purpose markup language. It describes structured data in a way that both humans and computers can read and write. You can create Google Gadgets to show cool and dynamic content that can be placed on any page on the web. They can be submitted in any of the following categories : News, Tools, Communication, Fun & Games, Finance, Sports, Lifestyle and Technology. After that I modified the <ModulePrefs...../> section and used the File Menu to save my gadget. Used the Preview tab to see how the gadget looks like. After saving the gadget it is hosted by Google on it's own servers. You get a URL or link to the Gadget. Google provides free hosting, free bandwidth and an easy way to submit your gadgets to the official directory, where users from all around the world come to find them. As you can see it differs from the simple "Hello World" Google Gadget (see first picture in this post) in having a 'User Preferences' section. If you want to add it to your blog sidebar go to the Google Gadget Creator Page. Here you can modify the gadget size to fit in your sidebar. You can also choose how many hacks to display and whether to show descriptions or not. After using the Preview button to customize your gadget click on 'Get Code' button' . 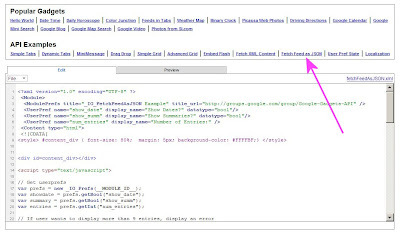 Copy and paste the code into a Html Page element in the sidebar. 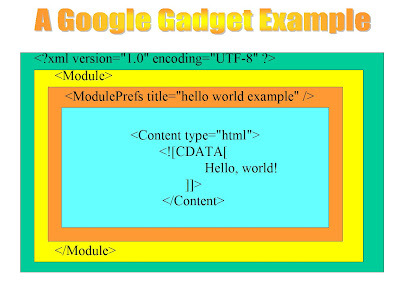 In the next post we will see how to distribute Google Gadgets and syndicate them to increase traffic to your blog. 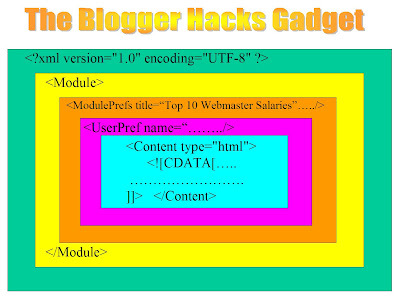 As you can see below you can put a Google Gadget within your post which you cannot do with a Blogger Widget. 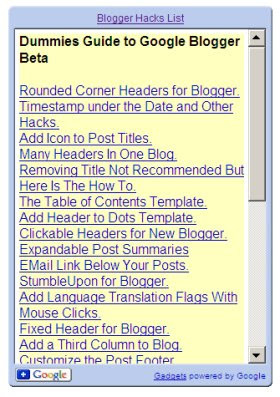 This is because the blog post is itself a Blogger Widget and you cannot put one Blogger Widget into another. Click the "+Google" button in the bottom frame of the above Gadget to add it to your personalized iGoogle page. I love gadgets and widgets! When I went to Google's site and saw all the widgets that they have I just knew that I would be spending yet More time online! But I have come to realize that as much as I like the widgets it is wise not to clog up one's site with them. Pick a few that you like and add them to your site but don't add so much that your site will look too crowded. Widgets very enhance site visibility for SEs. usefull things. first of all, thank you for all of this great information. much appreciated. second, is there any way you could post or send the exact code for this gadget? when i try to publish, i am warned that there is too much info missing (author info, email info, so on). i am a newbie to this stuff. any help would be terrific. Have a look at Google Gadgets in Blogger.